We tend to idealize the American cowboy. Of course, he deals with harsh weather: snow, thunderstorms, intense heat and bone-chilling cold. They all make paintings of cowboys dramatic and beautiful. But how often do we think of each individual day and of the work that needs to be completed no matter the weather? A cowboy, his horse and Chores to be done. Chores copyright© 2006 by G. Harvey is prohibited from being copied. 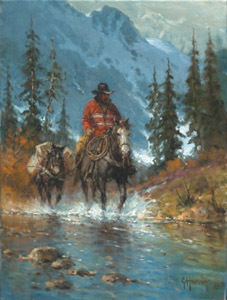 G. Harvey art, western, cowboys, texas, nostalgia, artwork, art work, canvases, images, paintings, pictures, and prints of Chores by artist G. Harvey for sale. Chores painting by artist G. Harvey can be purchased in art print or canvas form at special sale prices at Christ-Centered Art.